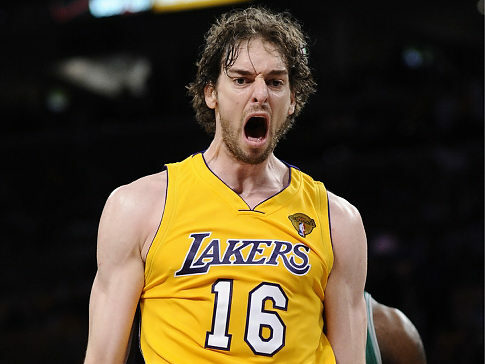 Rumor: Gasol not apart of Lakers’ future? With only Kobe Bryant, Steve Nash and Robert Sacre under contract heading into the 2014-15 NBA season, the Lakers have roughly $30 million to spend in cap space this offseason. But that’s only if they decide that their future will NOT involve center Pau Gasol. Gasol has been on record saying he wants to remain a Laker and how could you blame him? Los Angeles is where he’s had the most success in his entire career. In seven seasons with the Lakers, Gasol helped lead the franchise to back-to-back championships between 2009-2011, while averaging 18 points on 51 percent shooting, 9.2 rebounds and 3.3 assists. He was selected to the All-NBA third team in 2009 and 2010, and the All-NBA second team in 2011. It’s safe to say he’s been balling ever since he put on a Lakers uniform. He’s still one of the better power forwards/centers in the league and can still play at a high level. The 33-year-old will become an unrestricted free agent in July and he’s already listed a number of teams that intrigue him, according to NBA Editor/Basketball Insider writer Alex Kennedy. In an interview with http://t.co/K3B8ybZMdR, Pau Gasol mentioned the Lakers, Grizzlies, Bulls, Spurs as options he’ll consider this summer. On the other hand, parting ways with Gasol might be necessary if LA wants to make a run at another championship in the near future. Because Gasol costs a lot of cheese. A lot.